In order to help the reader to follow the argumentation of the tonal analysis, this book is organised in such a way that the segmental and tonal levels are discussed separately, followed by discussions on tone in nouns, verbs and minor word categories. After that, the study is related to the wider context of research on Guthrie's group R languages, especially the Wambo languages. Finally, the reader finds nominal and verbal paradigms as well as some texts, and a vocabulary Kwanyama-English comprising about 6,000 entries. Grammatiken mit ausgewiesenem Bezug auf Tonsysteme und tonale Strukturen sind für die Bantusprachen leider recht selten. Mit dem vorliegenden Werk von Riikka Halme liegt nun eine Untersuchung vor, die sich speziell der tonalen Analyse des Kwanyama widmet, [...] eine sehr gründliche Untersuchung [...] Die von ihr im Rahmen der generativen Phonologie (bspw. Kenstowicz 1994) herausgearbeiteten Regeln sind logisch-konsequent aufeinander bezogen und nachvollziehbar. Das abschließende Kapitel, in dem das zuvor herausgearbeitete Regelwerk noch einmal eine kurze Zusammenfassung erfährt, bietet dem Leser eine Hilfestellung für den schwierigen Untersuchungsgegenstand. 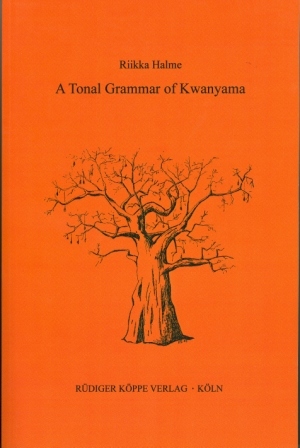 Riikka Halme’s monograph, „A Tonal Grammar of Kwanyama“, is an important contribution to the study of the Oshiwambo (Guthrie R.20) group of Bantu languages spoken in Angola and Namibia. Since tonal information on the languages of this group has been scanty, Halme’s broad and rigorous coverage is particularly welcome. […] Halme’s data and presentation are uniformly rigorous and thorough, and her analysis is careful. Data that are (appear to be) quite complex, both phonetically and in terms of their interactions, are clearly presented in a straightforward and easy-to-follow format.